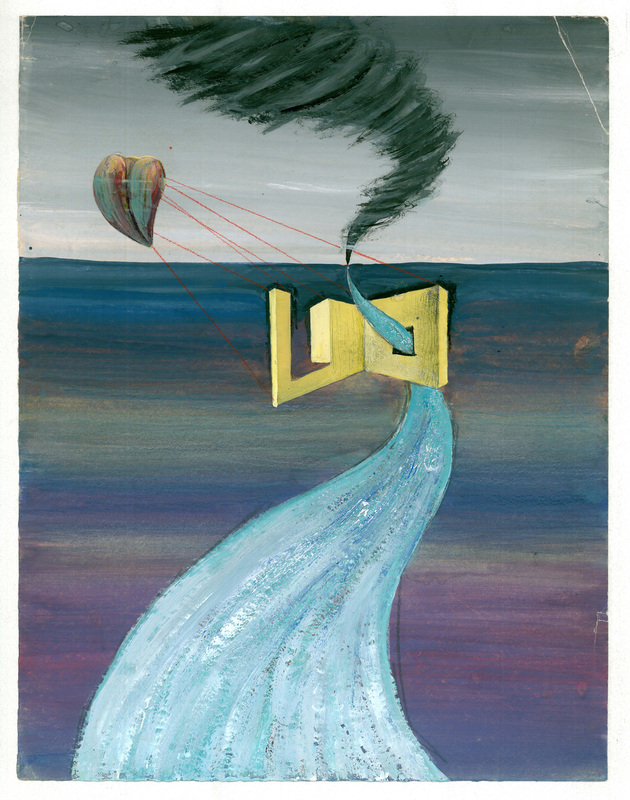 Nasui collection & gallery brings to Paper Positions Berlin 2017 a curated project named ”Surrealism and cadavre esquis – Hedda Sterne”, consisting of early works from the Europe period of the Avangardist Hedda Sterne, an American Romanian Jewish artist. The artworks shown for the first time at Paper Positions Berlin belong to the body of works and documents discovered by Nasui collection & gallery in 2014, which were kept locked for more than 75 years, encapsulated within a private archive. Born in Romania in 1910, Hedda Sterne (1910-2011) moved to the U.S in 1941, where her works later found their way to the collections of the Museum of Modern Art, the National Gallery of Art, and the National Museum of Women in the Arts. It is still difficult to make an introduction of Hedda Sterne other than by way of clichés that describe her either as the only female in the Abstract Expressionist group The Irascibles or the wife of the famous artist Saul Steinberg. The life and creation of Hedda Sterne before her move to New York in 1941 has not yet been known and researched enough. Her European story has not been yet told and its importance is still to be discovered. Hedda Sterne was an influential personality with an artistic career in Romania and Europe. She had very good connections to the cultural field, represented by her elite friends who were active in the European Avant-Garde and would all become well-known names in the history of arts. The artworks presented at Paper Positions 2017 by Nasui collection & gallery were found as an archive in Romania in 2014. It was one of those spectacular historical chances that an archive of Hedda Sterne, made up of artworks (paintings, works on paper, collages, sculptures), family photos and letters, notes, telegrams survived all together throughout the years and crossing several historical changes in Romania. From monarchy to communism and then to democracy, the Hedda Sterne’s treasures travelled through time waiting to get to proper light. Like many female artists, until nowadays, Hedda Sterne was shadowed by the powerful men artists of her time. Metaphorically or not, if you look at the famous photograph taken by Nina Leen in 1951 for LIFE magazine, all the important man artists like Jackson Pollock, Barnett Newman, Mark Rothko, Willem de Kooning, Adolph Gottlieb, Robert Motherwell or Clyfford Still, from the The Irascibles group, were and still are shadowing Hedda, the only woman artist in this historical photo and art history context of the above mentioned group. An artist of many styles? The art of Hedda Sterne could not be completely understood if looking only at her creative years after 1941, the year she arrived in New York. Considered as an artist of many styles, Hedda Sterne was in fact her own keeper of strong constancies of some particular interests, noticeable across her entire creation. Her formative and experimental activity from 1919 to 1941 shaped and matured her creative thinking and artist practice. There are many themes, interests and even types of iconographies she came back to over time, over and over again. And these interests were found in her art before 1941, the year of leaving Romania and Europe. Hedda Sterne`s art cannot be revealed if not taking into consideration the many aspects of her life, pending between the two political worlds in conflict. However, Hedda Sterne was part of front groups of experimental art movements both in Europe and in US. As a young artist, she was rather opposite to the academic or official art. She attended the Decorative Art Academy of Max Herman Maxy in Bucharest, where the spirit of Bauhaus and Art Deco were promoted, and the University of Bucharest, Art History and Philosophy department. The academic years of Hedda overlapped the surrealist and dadaist preoccupations. Being already in the group of Avant-Garde friends, she started working alongside them: Medi Wechsler Dinu, Theodore Brauner, Jules Perahim. They were experimenting the creative techniques of Cadavre Esquis learnt from Victor Brauner, as a close family friend. During the period 1928–1931, Victor Brauner contributed to ”unu” magazine (an Avant-Garde periodical with Dadaist and Surrealist tendencies), which published reproductions of most of his paintings and graphic works. ”unu” magazine was edited by Gheorghe Dinu (alias Stephan Roll), later Medi Wechsler’s husband, and Sașa Pană. Hedda Sterne, Medi Wechsler Dinu, Theodore Brauner and Jules Perahim were experimenting Cadavre Esquis both in art and literature. The group even innovated the genre in elaborating the following technique: folding the paper not only vertically or horizontally but simultaneously horizontally and vertically. They call it in Romanian language: ”Cadavre Vii” (Living Corpses) sau ”Cadavre Delicioase” (Delicious Corpses). Sophisticated compositions came to life from this relaxed joyful-friendly act play. Some of them were addressed to Gheorghe Dinu with the intention of a later publishing within the magazines he was editing at the time. À-propos strong constancies, Hedda reconsidered and reused these early experiments results for her ”Diary” artworks in 1976. From 1924 to 1941, Hedda Sterne created multiple forms of art which can be seen as series in her flow of artworks. In the process of creation, there are several aspects that lead a body of artworks to become a series. The particularity of these series consists in the fact that they are formed of types of themes or creative sessions that focus and consume a peculiar subject within one theme / session. There are also surrealist compositions with fantasy and fairytale atmosphere, with princesses and castles surrounded by huge scale flowers. This particular series very much resembles the doodle drawings of Antoine de Saint-Exupéry, whom she met on the ship on which she traveled to the US in 1941 and whom she became close friends to. The style is acid, minimalistic and the line is thin. The concentration is attracted by the black lines giving life to large white surfaces of the paper. When she chose color, the style shifted again, using colored perspective effects. Collages were part of her preoccupation and hazard was always present within the artworks. Hedda used different cutouts from magazines and papers, which she threw on another paper. She would glue them as they accidentally lie down and integrate them within drawings in surrealistic strange compositions. Portraits have been very important to Hedda Sterne along her entire career. In her early years, she portrayed many of her friends and relatives. In her portraits, Hedda did not try to make studies of them in a realistic manner. She practiced studies of human expressions. There are portraits like that of ”Bunti of Geo Bogza” which are actually compositions, introducing elements like a window and the landscape that can be viewed through it. One can notice the style developed by exercise and its freshness can still thrill the viewer. In some other drawings, she unveiled a character’s personality not by use of portrait, but of particular parts of the body, for example only hands. Hedda Sterne also used introspection. There are different series of self portraits that apply special focus on eyes, ears, mouth and hair. She was attracted to these anatomical parts which in some compositions dove in surrealistic floatation, without even introducing a portrait. Nasui collection & gallery is an independent organization that collects and supports modern and contemporary art and artists. Through the Gallery, it has exhibited extensively in museums, galleries, cultural centres and public spaces. The Collection has the following focusses: Historical Avant-Garde; Jugendstil; Socialist realism, Propaganda in Art; Postmodernism; Contemporary Romanian Art, Neo-figurative, Speculative Realism. From April 28 – 30, 2017, during Gallery Weekend in Berlin, 30 galleries from Germany, USA, Austria, Romania and the Netherlands present their most significant artistic positions of contemporary and modern art with focus on paper works: drawings, collages, paper cuttings, text works, photography, art books and objects at PAPER POSITIONS. The group show will be held in a most central location on the first floor of Bikini Berlin. The Bikini Berlin – directly located at the Berlin Zoo – is one of the few still preserved contemporary eyewitnesses to the eventful history of post-war Berlin. From 1977 to 1993 it was also the location of the Staatliche Kunsthalle Berlin.